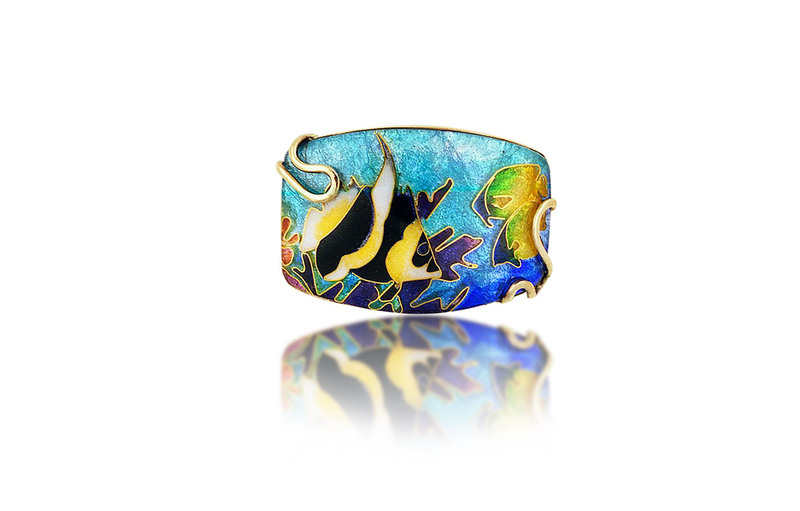 Angelfish is a cloisonne jewelry piece created by Patsy Croft. It belongs to Ocean collection of amazing enamel jewelry with unique jewelry designs. I’m passionate about our oceans. As a certified, master diver I spend a lot of time in the ocean, and it reflects in my work. Angelfish are one of my favorite sea creatures. They hide so well, and when they come out of the reef, and you see their detailed coloration, you understand how they blend in with the patterns and shadows of the reef. They are truly vibrant and showy in their colors. Their elegance and grace are mesmerizing. What is most impressive is that while they can be considered shy, they are really bold and fearless with divers, coming up to us and exploring us while we explore them. They really make an impression on my visits to their world. So much so that I had to commemorate them in my cloisonné jewelry work. I very much enjoyed my time drawing them out with pen and ink, and applying my watercolors to the palette, bringing them to life. Taking my painting to my goldsmith studio, I prepped my metal and applied the 24k gold wires, creating the outline of the piece. Once done, I carefully placed my enamel grains in each cell, three at a time, deliberate to not overfill. With several layers applied, the movement, depth and transition of colors from dark to light was discernible. I had my enamel jewelry reef piece, in tranquil waters, highlighting the remarkable Angelfish. I then set it in 18k gold, creating a pendant to be worn close to the heart. This unique jewelry design is one of a kind jewelry. You will not find anyone else in the world with this specific piece. Being able to create custom enamel jewelry that brings awareness to the environment is one of my passions. My other passion is our environment. I have made a pledge to donate a portion of all my proceeds to Greenpeace, Jean-Michel Cousteau’s Ocean Futures Society, World Wildlife Fund and the American Association for the Advancement of Science. If you’d like more information on Greenpeace, you can go to this link: http://www.greenpeace.org/usa/. If you’d like more info on Jean-Michel Cousteau’s Ocean Futures Society, you can go to this link: http://www.oceanfutures.org/about/jean-michel-cousteau. If you’d like more info on the World Wildlife Fund you can go to this link: https://www.worldwildlife.org. And If you would like more info on American Association for the Advancement of Science, you can go to this link: https://www.aaas.org. If you’d like more information about Marine Angelfish, you can go to this link: http://animal-world.com/encyclo/marine/angels/angels.php.